University of Madras - Distance Education Programmes... Admissions Open!!!... MBA (2/ 1 year), MCA (3/ 2/ 1 year), BCA (3/ 2 years), BBA, B.Com, BA, B.Music, B.Sc, M.Sc. (Physics / Chemistry / Maths / Psychology), MA, M.Music, M.Com, B.L.I.S, Fashion Design, Vis.Com, Multimedia. The University was established on 5th September 1857. The University was organised in the model of London University. Madras University is the mother of almost all the old Universities of southern India. The University imparts both Under Graduate and Post Graduate Education through the Affiliated Institutions which are spread over the districts of Chennai, Thiruvallur and Kancheepuram. Apart from teaching, research activities in Arts, Humanities, Science, Management and Technology are the main portals at the University. A number of institutions affiliated to Madras University Concentrate in research activities where Ph.D., Programme is available in their respective field of specialisation. The University is also offering teaching and Research programmes in 4 Campuses of Madras University. The 68 University Departments of study and research are spread over in 4 Campuses organised into 18 Schools each of which offer Post Graduate Courses in respective specialisation, part time and full time Ph.D. Programmes, Diploma and Certificate Programmes. M.C.A. and M.B.A are well designed professional training courses for aspiring graduates in the respective specialisations. The University has been accredited by National Assessment and Accreditation Council (NAAC) with the five stars rating first, and later with an A Grade rating. The UGC has recognised the University as one of the centres for potential for excellence in the country. Based on the excellent performance, the University of Madras was accredited by NAAC at FIVE STAR LEVEL. 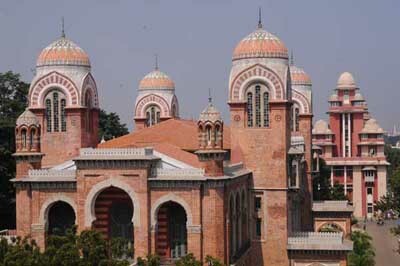 The Institute of Correspondence Education of the University of Madras now called the Institute of Distance Education was established in the year 1981. Admissions are made throughout the year under Academic year(June to December) and Calendar Year stream(January to May). The Institute of Distance Education at present offers 105 programs: Under-Graduate 26, Post-Graduate 24,Professional 17,Diploma 25 and certificate 13. Under various Programmes offered by the IDE about 3.0 lakhs students are on roll.